In Belle Plagne, between glacier and forest, the chalet is covered with wood and flagstone and located in the Andromède apartment building. Come and leave with your skis on to access La Plagne-Les Arcs resort. A ski school is at the exit of the apartment building. Minimarket and ski rental 30 metres away. South-facing apartment for 6 persons with view of the valley and the mountains. 80 metres away from downtown. Interior has a wooden chalet style and features all comforts. 1 bathroom upstairs with 1 wellness bathtub, 2 hand basins and separated toilet. On the lower ground floor, 1 shower room with shower, hand basin and toilet. We had an excellent stay here mid-March. The weather and snow conditions were perfect so being ski-in-ski-out was ideal, and the location to the bakery/Spar was extremely convenient. The apartment itself was a perfect size for the 4 of us and the kitchen was very well equipped. The jacuzzi was a particular bonus after a long day’s skiing! Pascal was very responsive and easily contactable before, during and after our stay. Merci encore Pascal - à bientôt! je vous remercie pour votre appréciation . J'ai été content de vous recevoir Si vous souhaitez relouer mon appartement ce sera avec plaisir . Clean, comfortable, well planned out accommodation. Great kitchen area, beautiful views, convenient location. Lovely apartment in perfect location with very helpful owners. What a lovely apartment! This is a perfect place to stay - wonderful location, stunning view, great facilities and really helpful owners. Many thanks, Pascale and Carole - we very much hope we can return soon! Thank you for your nice appreciation , i hope to see you again next time . We really loved the decor of the apartment and the location was superb - ski in and out of the entrance and right opposite the Spar. The owners were really helpful with all our queries. Having proper bedrooms was a real luxury compared to the usual ski accommodation. We’ll be back! 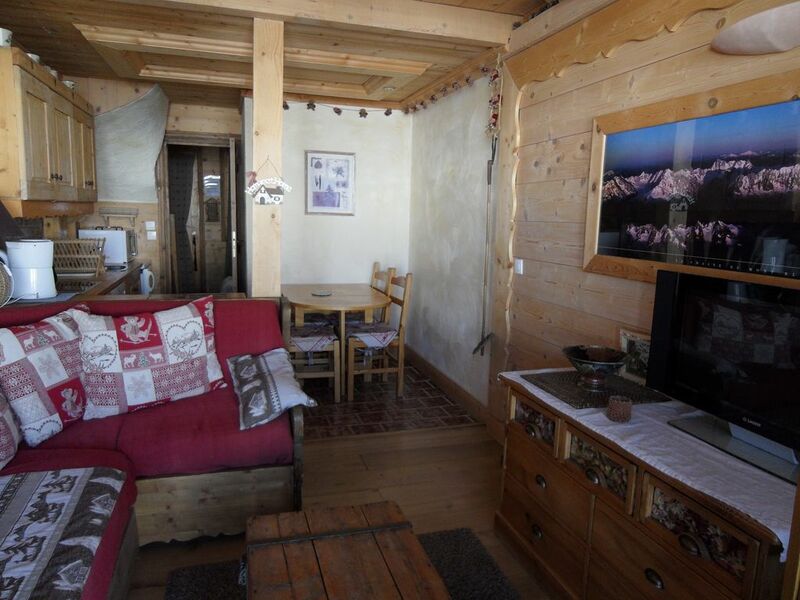 Confortable chalet, ski in-out, beautiful view of the mountains and sunny at afternoon. The jacuzzi is a plus after-ski. Ideal for a family with kids. It was easy to got the keys and the apartment was clean at our arrival. Thanks Mr Pascal for our stay. Thank you for tyour nice comment . I hope to welcome youonce again . Belle Plagne resort (2100 m). Close to all amenities.